It seems like only yesterday I was writing my five month update yet here we are, another month later and half a year has now sped by since Baby Boy burst onto the scene. We’ve seen some big changes, done a multitude of things, visited a number of new countries in these past months. It feels as though Baby Boy has always been a part of the family and it’s strange looking back to a (parenting) time without him. Is now indeed a terror. A three year old terror. A threenager. Apologies to anyone who may have tried to warn me about this phenomenon to have me scoff in their face that it wouldn’t happen to me. It has. When we aren’t having monumental tantrums over small insignificant matters massive world catastrophes like, maybe putting your shoes on before you walk on the boiling hot floor outside, we really are the most pleasant little boy around. So for about 87% of the time I’m dealing with my gorgeous boy the other 13%? The threenager monster…. But let’s not focus on that side because really in the last month so much has happened, we are back at nursery and after a shaky start we now wave happily to mummy when she leaves. Every day he is allowed to take one toy to nursery with him which then must go into his drawer for safe keeping before coming home again. It’s really helped him to settle knowing he has something from home there, that is his to look after. I’m loving the structure and the time with just Baby Boy and the Toddler is loving the activities that he’s getting to do. Then, last week he turned 3 so we had a party. With a digger cake. Where the boys all claimed a digger each and rolled it through the icing to lick off the wheels…..
Before heading out to his birthday present – a trampoline! Best thing we could have bought, we’ve used it every day as the sun sets and temperatures cool down. Even more excitingly, turning three has led to the demise of the nappy…..
Yep we are busy starting on our potty training journey. It’s been interesting and has led to one of his most frequent sayings this month all about the wee wee biscuit…..
Can I have a bagel biscuit? You come back for me? Sometimes I worry I expect too much from him as his speaking makes him seem much older than his three years after all he is still just a baby, my baby. Still drooling BUT we have TWO teeth. Bottom 2 in the middle are poking through and whilst I’ve not been able to get a good picture they’ve drawn blood on the husbands nose (serves him right for putting his nose in there in the first place) and definitely have a nip if you get too close. 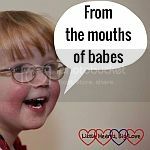 His teething journey is different to the Toddler’s, one morning the Toddler woke up with teeth then the next thing I knew he had another four. Once they popped they came through quickly but I think Baby Boys will be a lot slower. Still rolling and desperate to crawl. He’s managing to get himself moved around on the floor through a mix of squirming and rolling but the arms and legs are going along with the frustrated squeaks. Of course 6 months also means the introduction of food. And mess. Unlike the Toddler we are skipping purees, I think it’s just lazy parenting on my part but the idea of batch cooking purees and washing the blender just filled me with dread so Baby Led Weaning it is. In fact at times it’s Toddler Led but that’s a story for another day…. Sleeping. Ahhh sleeping. I love to sleep. Turns out Baby Boy, not such a fan. Still no real routine, but at least this time I’m not stressed about it like I was when the Toddler was a baby and not following the books. I’m following the husbands advice and continuing to read the baby. The baby wants to sleep for 30 minutes on the dot for nap time, generally on the nursery pick up and drop off route, then that’s what he needs. And if he wants to party all night. Well. Just call me the life and soul……. What’s this noise? What happened to real music? Ooh I don’t miss the days we used to go out clubbing. I also got a photo of us both, a rare occurrence. The very next day we had visitors arriving in the form of the husbands brother and sister. So it was straight from night out to brunch extravaganza. You know? Where your glass is never empty and it’s a good idea to upgrade to champagne (it’s not). Other than everything being alcohol fuelled and generally subscribing to the hungover parent school for a couple of weekends – and spending an absolute fortune this month with added expenses like nursery and birthdays on top – we’ve had a lot of fun, a couple of swim sessions, bouncing on the trampoline, barbecue season is kicking off. We’ve also made a new takeaway discovery. After months of separate take away orders (this is Dubai it’s perfectly normal) we both had Turkish from Kosebasi restaurant in Dubai, to help celebrate their birthday, and we were not disappointed. Demolishing the takeaway we discovered why they have been going strong for the past 20 years, with both a dine in and takeaway option. Having been to brunch and needing the comfort of Pj’s to eat a massive amount of food we opted for take out. From a delicious starter of the creamiest hummus to a tender “Kosebasi Special” kebab we were not disappointed and will be going back, we might even eat in next time but there was something to be said about munching this in your PJs….. with expandable waistline to fit more in your tummy. Other than that it’s been a whirl of socialising, work and trying out new recipes on the husband….. until next month, where I hope I won’t be reporting that the Baby is on the move but I have a feeling I will be. You can find our seven month update here. Disclaimer; we were gifted the takeaway from Kosebasi in order to help them celebrate their birthday, all opinions are my own and it was honestly the best hummus I have EVER eaten. Sounds like you have been really busy! Love the birthday cake, looks really delicious! I have a 2 and a 6 year old (both girls) and they both often protest (together) that they don’t want to put their shoes on or even listen to anything I’m telling them, its hard because my youngest copies everything her big Sister does and that includes the naughty things!! It’s been one of those months where visitors love to come and the Toddler has his birthday so it gets busy and expensive. Oh, I hadn’t even thought of when the little one can join in with the big one…..
Haha yep, wee wee biscuits are prime currency here! I don’t envy you at all. My middle son has just turned 4 so has just about left that stage and I’m dreading my baby hitting it, a nightmare! The digger cake is amazing! So four is where it looks up?? Kerry recently posted…Wedding planning | Less than a year to go! I worried and worried and worried. Then he arrived and it’s just like he’s always been here! Sounds like you have had a busy month. We are 3 months into being a family of four and it still seems unreal that we are. Love the digger cake……will have to remember that one for the future. Congratulations on your newest addition, those first 3 months feel like a blur now! Anything that’s round with a hole in it is now a bagel. Not sure why though because we never have bagels! It definitely feels like only yesterday the Toddler was born let alone the baby! 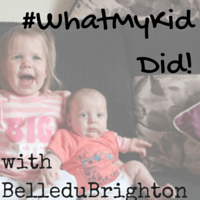 Mummy’s Blog recently posted…Toddler Talk! I love the quotes – one reminded me of my nephew when my sister took my baby to pick him up from nursery, he asked if they were keeping her! Bless them. I hope the potty training is going well and baby is enjoying his food. We have recently moved on to mainly finger foods and I love it, so much less effort on my part! Hahaha! I enjoyed reading it. I can definitely relate with the massive world catastrophe! We get that in the house, too. And that digger cake is a blast! I’m thinking of getting my 4-year old one. I’m sure he’ll love it just like the trampoline I got him for is birthday last year. It was a pretty good one, durable and made sure it’s got safety features. Just wondering, is the digger available in green color? My son prefers green over the others.